The wood burning oven at Hartwood. Photo by Gentl & Hyers. 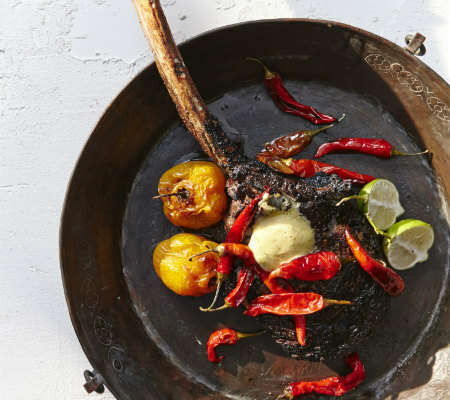 For years I’ve heard reports of a remarkable restaurant in Tulum, Mexico—run by American expats—where all the cooking is done over wood fires, and the flavors explode in your mouth like fireworks in a 4th of July sky. 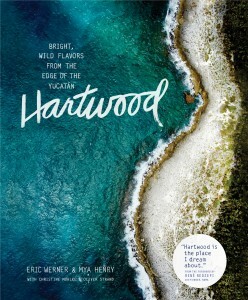 Well, now you can experience the restaurant Hartwood and the timeless wisdom of wood fire cooking from founder-chef Eric Werner in a stunning new book called Hartwood, published by our sister publisher Artisan. Read it and let your mouth water. I know where I’m headed this winter. Maybe we’ll meet in Tulum. 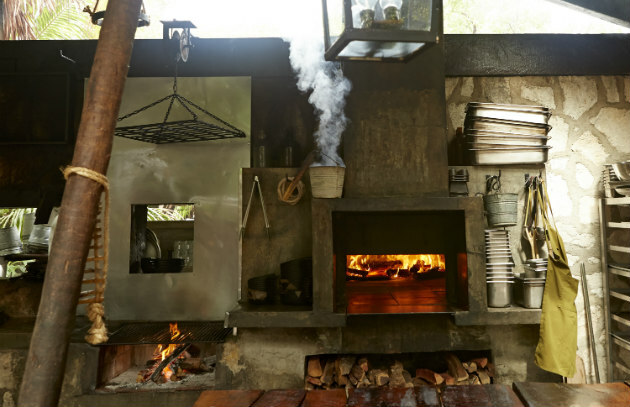 At Hartwood, we start a lot of our dishes on the grill and finish them in the wood-burning oven. The grill gives you nice markings and a subtle wood flavor so that the food has a foundation of char and smoke, while the oven cooks it quickly and thoroughly. It’s not so different from how most professional kitchens work: there you start with a sauté pan on the burner, then finish by putting it in a hot oven. We’re doing the same thing, only the fuel we use is wood. We don’t choose to work over open flames because we’re fire junkies who need to prove ourselves by how hot we can get our oven. We do it to be in a silent conversation with the fire. It’s amazing that something can be so quiet and yet so powerful. No two fires are ever the same. The fire is like the sea or the wind, a force of nature that you can direct but that you can’t fully control. You build it, tend to it. Then you follow it. The best way to understand how to cook with wood fire is through practice. Experience is the best teacher, and you’ll learn more from your mistakes than when everything goes as planned. That said, there are a few tricks that can help. One, roast the wood before putting it on the fire: Place two or three pieces of wood at a time on a grill grate set well above the kindling so that the flames dry out the wood even more than it is already. (Make sure that the grate is high enough that the wood won’t catch—it’s okay if a few splinters flame up, but you don’t want to start a second fire.) If you roast logs before adding them to the fire, they will ignite in seconds, not minutes. Two, use a four-inch stub of candle to help start the fire. (At Hartwood, we use the ends from the candles from the dining room.) Crumple up two or three sheets of newspaper, pile the kindling on top, and put the candle deep in the center of your construction—it’s the nucleus. When you light the newspapers, the fat from the candle will act as an accelerant, and the candle will fuel the fire. Three, use the roasted wood to build a structure that will allow the air to come in and feed the flames. You want the air to enter through the bottom, so stack the wood to create an opening that functions like a door. Put light, dry wood on the bottom and denser wood on top. The light wood will catch more easily and then ignite the denser wood, which will burn into a bed of embers. That’s what you want. You can use the high flames of a catching fire to heat up pans and boil water, but you want to cook over low flames or embers. High flames will scorch the outside of what you’re cooking and leave the inside raw; the rolling flames you get from the embers will give you a good surface sear and cook the food all the way through. The flames are what make grilling with wood different from grilling with lump charcoal or briquettes—that and the flavor they impart, which is smokier and cleaner. You can learn to control the flames. It’s not so different from cooking on the stovetop, where you turn the burner knob to increase the heat. Add wood to bring up the temperature and create more flames: If you add two pieces, it’s similar to giving a quarter-turn to the knob; four pieces it’s a half-turn. If you want to bring the heat down, use your tongs to move some of the wood to the side. When you’re cooking a piece of meat, you want high heat, with intense flames, to add grill marks and to sear the exterior. You don’t want fat-fed flare-ups, but the high heat is important. It should be uncomfortably hot—if you can hold your hand close to the grill, there isn’t enough heat to cook a steak or a piece of lamb. It’s different when you’re cooking fish. You want high heat at first to crisp up the skin so that it doesn’t stick to the grill, but then you want to bring down the heat quickly so that the flesh cooks evenly. If you add pieces of wood to sear the skin, you may want to move them to the side to cook the fish the rest of the way, then repeat for the other side. This isn’t a hard-and-fast rule, though. It could be that the wood you’re using produces intense flames, or it could be that it burns down and becomes part of the bed of embers. You’re going to learn by doing. You need to watch the flames, the wood, the food. You need to make mistakes. You will get better, but it will take time. At home, most people don’t have a grill and a wood-burning oven. But you have other options, and what you do is up to you. You could cook the food entirely on the grill: Start over a high-heat, high-flame zone and then move to a medium-hot part of the grill, where it will cook through without being incinerated. You could grill over wood, then complete the dish in a preheated conventional oven. Or if you don’t have a grill, turn up the burner on your range: use a well-oiled cast-iron skillet brought to a high temperature on a burner so that it gives what you’re cooking a nice sear, then transfer the pan to a hot oven. Excerpted from Hartwood by Eric Werner and Mya Henry (Artisan Books). Copyright © 2015. Photographs by Gentl & Hyers.